In the last few months, the writings of Andrew Sullivan have been among the more hysterical and unhelpful guides to understanding our situation. Sullivan believes Trump’s presidency is literally the end of America as we know it, and thinks the proper lesson from Trump’s ascent is that there is simply too much democracy in this country. He is among the many commentators whom Trump seems to have turned slightly mad (though he has long been a conspiracist). It is therefore little surprise that he continues to have conniptions over Trump’s never-ending stream of untruths. What are we supposed to do with this? How are we to respond to a president who in the same week declared that the “murder rate in our country is the highest it’s been in 45 to 47 years,” when, of course, despite some recent, troubling spikes in cities, it’s nationally near a low not seen since the late 1960s… What are we supposed to do when a president says that two people were shot dead in Chicago during President Obama’s farewell address — when this is directly contradicted by the Chicago police? None of this, moreover, is ever corrected. No error is ever admitted. Any lie is usually doubled down by another lie — along with an ad hominem attack. Here is what we are supposed to do: rebut every single lie. Insist moreover that each lie is retracted — and journalists in press conferences should back up their colleagues with repeated follow-ups if Spicer tries to duck the plain truth. Do not allow them to move on to another question. Interviews with the president himself should not leave a lie alone; the interviewer should press and press and press until the lie is conceded. The press must not be afraid of even calling the president a liar to his face if he persists. Well, good luck with this. Sullivan’s thundering outrage about Trump’s relationship with the truth, as well as his proposal to meet this with more insistent fact-checks and new rounds of follow-up questions, nicely illustrates a particular tendency shared by many of Trump’s opponents in the media. 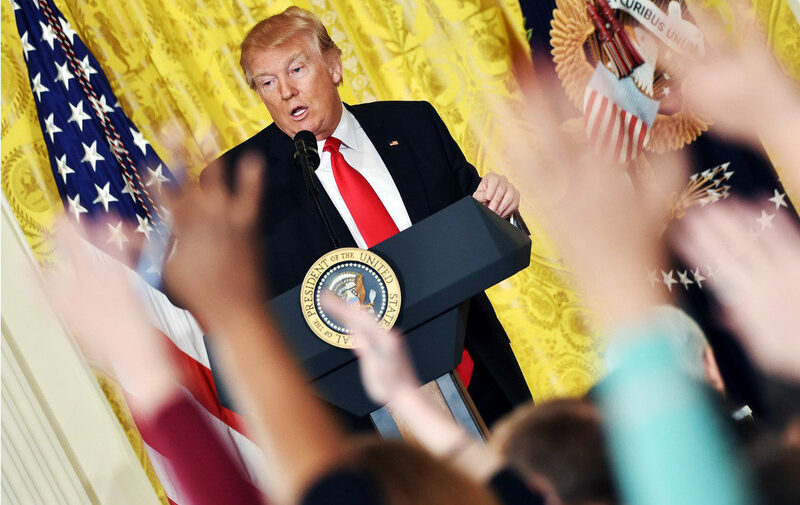 Seeing a “post-truth” presidency fueled by “fake news,” they respond by demanding that the press become more resolute in checking Trump and upholding its public duty to prevent the light of truth from being extinguished. All of which sounds good and noble, as well as difficult to argue with. But I think it overlooks two important and related issues: effectiveness and humility. First, it’s not enough to check the facts and shout that Trump is a liar. You have to actually get people to believe you. Second, the “Trump is a liar and the press must hold him accountable” framework allows journalists to avoid self-criticism, and makes them less likely to concede when Trump is actually right on the facts. If you’re always out to get Trump, you’re less likely to be fair to him, and if you’re not fair to him, you’re less likely to persuade the people whom you seek to persuade. Trust in media is at an all-time low. That should concern journalists just as much as Trump’s lies, because it means that they can fact-check the hell out of whatever they like, but few people are likely to believe them. You can scream as loudly as you like that Trump has exaggerated the crime rate, but unless you work on the trust problem, you’ll be shouting into an empty void. Working on the trust problem will require scrapping the simplistic idea of a “truthful press” against the “lying President.” In fact, precisely because so many journalists have adopted the Sullivan worldview, thinking of themselves as the heroic guardians of truth against a habitual liar, they have ended up pushing dubious anti-Trump stories. The Federalist compiled (and Trump retweeted) a list of news stories since the election that have tried to damage Trump, but have been either false or exaggerated. For example, journalists spread a claim that there had been mass resignations from the State Department in protest of Trump. This was totally false. Members of the media have gone absolutely apoplectic over Trump’s incorrect claim that there is mass voting by non-citizens, without acknowledging that it was The Washington Post that first published a study suggesting this was the case. And nearly every standard of journalistic scrutiny and restraint is instantly jettisoned when it comes to stories involving Trump and Russia. But this is missing some key points. First, while Trump’s statement departs slightly from the literal facts, Trump isn’t the only one who thought the uranium deal was a serious issue. A New York Times report in 2015 confirmed that “the sale gave the Russians control of one-fifth of all uranium production capacity in the United States” and “brought Mr. Putin closer to his goal of controlling much of the global uranium supply chain.” The Times also raised ethical concerns about Clinton’s approval of the deal, noting that “shortly after the Russians announced their intention to acquire a majority stake in Uranium One, [Bill] Clinton received $500,000 for a Moscow speech from a Russian investment bank with links to the Kremlin that was promoting Uranium One stock.” Second, and more importantly, what Trump was trying to draw attention to was the double standard that is applied to him when it comes to Russia. If Trump had been involved with this kind of deal, with similar financial compensation from Russians for a speech, for many in the press it would have been further evidence that Trump is a puppet of Vladimir Putin. But nobody thinks that about Hillary Clinton. Clinton’s approval of the uranium deal may have been wise, but Trump mostly raised the issue to draw attention to the fact that the reporting on his own relationship with Russia has been over-the-top conspiratorial. 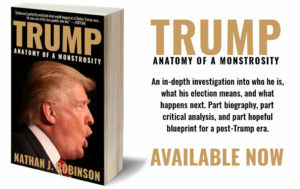 I don’t think anybody can accuse me of liking Donald Trump; the book I’ve written about him is called Anatomy of a Monstrosity (available in paperback for $17.95) and is, let’s say, not especially complimentary. But it’s precisely because I so strongly oppose Trump that I am strongly determined to make sure all of my claims about him are defensible. The New York Times recently reported that certain people may actually be made more sympathetic to Trump by overreactions to him, although the evidence suggests that support for Trump is shrinking rather than growing. If you are concerned with actually stopping Trump, you need to ask how to get people to listen to your criticisms. And if you’re talking about the death of the Republic, and failing to recognize that beneath a factual misstatement there may be an underlying true point, people will be justified in feeling as if you are not a credible arbiter of truth. Group A: Interventions by government What regulatory interventions, if any, are appropriate by government actors? In the US context, how does the first amendment act limit interventions? Group B: Interventions by private sector For companies such as Facebook, what steps are possible and desirable with respect to controlling fake news and misinformation? Group C: Interventions by third parties What kinds of interventions are possible by third parties– fact checkers, extensions, apps? Group D: What role for the academy? Crossing disciplinary stovepipes to understand and mitigate the effects of fake news. The presumptions here are instructive, as well as the omissions. The idea here is that consumers are making bad choices, and it is up to us to intervene and stop them. It’s no coincidence that the conference’s keynote speaker was Cass Sunstein, who is best known for proposing ways to manipulate people into acting the way policy-makers want them to act. But by skipping the question of how to define fake news, efforts to stop it will inevitably be partisan. Just as Sunstein’s “nudge” idea contains an implicit set of assumptions about what constitutes people’s self-interest, any use of the phrase “fake news” will necessarily contain an implicit judgment criterion for what it is and isn’t. In this case, the buried assumption is that mainstream media organizations are not fake news; fake news is something that comes from independent and “fringe” media. The Harvard conference once again shows how the need to improve the media itself is consistently overlooked. Instead of asking why people don’t trust the newspapers, and how the newspapers can restore that trust, we ask how people can be stopped from making bad choices. The solutions are things like “apps” and “extensions.” (It’s unclear how such things could possibly do any good, seeing as they would only ever be used by those who are already concerned with the problem.) The conference posed the question of how “public institutions, e.g. local, state and federal government” should intercede, even though any attempt by government to become arbiters of truth and falsehood would be terrifying. I sense a certain impotence here. Liberals see a bunch of false things flying around, and don’t know what to do. Because they think the mainstream press generally does a pretty good job, the only possible solutions are to (1) hire more fact-checkers or (2) empower some entity, such as Facebook or Twitter, to determine what is true and what is false. But both of those ideas are disastrous. Nobody will read the fact-checkers, and their belief in their own factual correctness will end up leading them to ignore their own biases, which will lead even fewer people to read them. And Facebook can’t possibly sort out what’s true and what’s false, and nobody should want to trust it with that job. 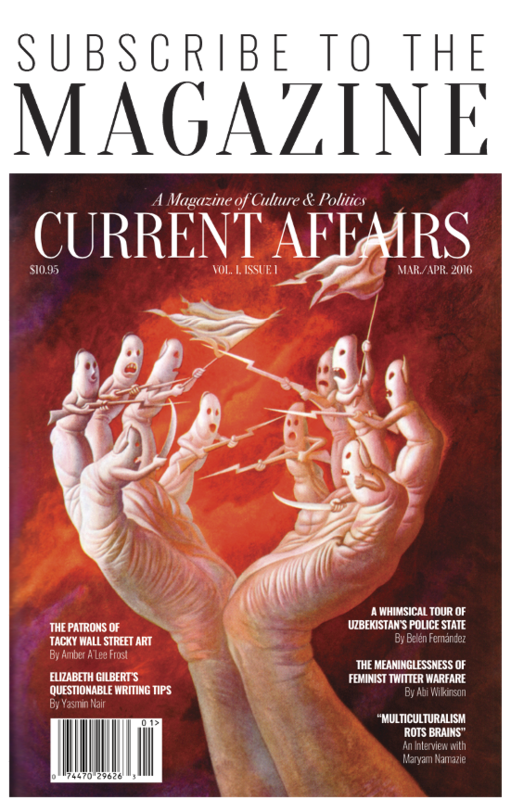 There is an undercurrent of arrogance and presumption to some of the discussion about fake news and Trump. Media figures are outraged that they, the trustworthy and good, are being disbelieved and shat upon. Chuck Todd of NBC haughtily declared after Trump’s press conference that “delegitimizing the press is un-American.” (On the contrary, delegitimizing the press is a sacred patriotic duty.) And Andrew Sullivan is an unabashed elitist, upset at an excess of democracy. Because such people refuse to recognize that many people have perfectly good reasons for not listening to a word they say, they aren’t committed to taking the kind of self-critical steps that will actually fix the problem they care about. It’s not that fact-checking is bad or unnecessary. Obviously journalists should challenge the president, and consistently hold him accountable. But repairing the problem of fake news and getting people to disbelieve lies will require much more. It will require a press that people respect, which will require clearly examining one’s own buried assumptions and values.